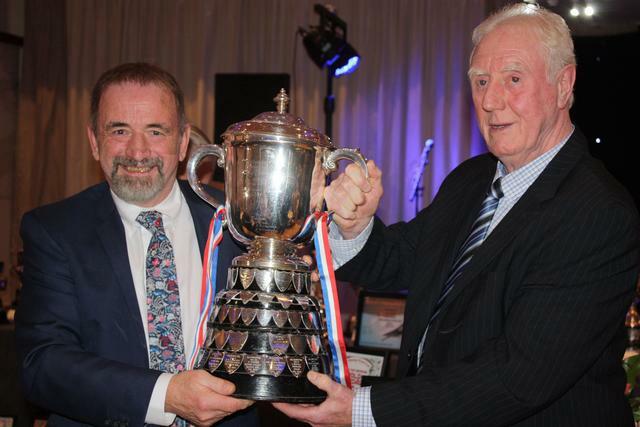 Fanciers and friends from across Ireland celebrated the racing season at the annual presentation of prizes for the Irish National Flying Club held at the top class Stormont Hotel in Belfast on Friday 23rd November. On this special night Chairman Leonard McCavery welcomed another full house and introduced the top table. Special guests Mr and Mrs Phil Smith from Stillorgan in County Dublin were joined by Secretary Trevor Topping and his wife Florence, with President David Black and his wife Janice. Leonard thanked Ronnie Johnston and his wife Alice for organising the event and for all the work they do in gathering the trophies in and preparing them for the night. He congratulated all the – especially the King’s Cup winner, Michael Fitzgerald from Gilford. Leonard went on to thank all our sponsors including, Frazer Animal Feeds, Bamfords Top Flight, H Beattie & Son, Sawyers & Co Estate Agents and British Homing World.